Marsy – the lovely lad! Well, after a long shivering Spring May arrived with sunshine and warmth and it carried on with temperatures soaring into the 30’s during July. The rain came and remembered to leave – an extremely important necessity after the last few years. Although now cooler and a few more showers it is still warm like I remember it being when we first came to Cornwall 24 years ago. After a slow start the moor is now full of young, I think they all knew we were going to have a good summer. 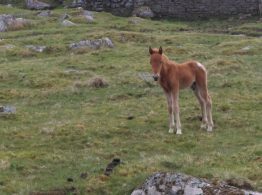 By May there were only a couple of foals to be seen yet by July the place was seething with young foals and calves and they’re still arriving. We had to cut our moorland jaunts down as Marsy couldn’t walk too far but now myself, David and Pebbles are all enjoying exploring our old wanders once again. We celebrated 15 years at Darrynane in July and a very happy time we have to look back on. Our children are now grown. Tim is living in Bristol and is an Ecology Consultant doing a job he loves. Seb is at Trinity St David’s University in Lampeter studying Archeology and Anthropology and Ameisha has just left school and is off to Truro college in September to do her A levels. 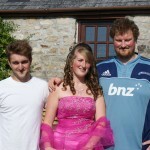 She had her prom in July – she looked stunning – we await her GCSE results this week. The one sadness this summer has been the loss of Mars Bar in August. 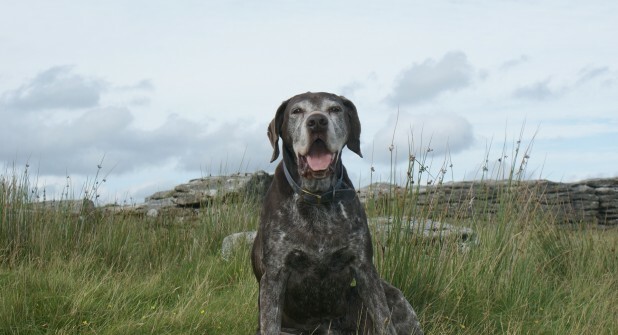 He loved his life and even though he had a gammy leg he still continued to enjoy his walks and his food right to the very end. Before our walk each morning we had to move the car up the slope so he could get in easily. He was too heavy and awkward to lift. I would take Pebbles out put him in the car and move it. David would stay with Mars in the house. Marsy hated the thought of being left behind and would sulk and stomp about until he realised he was going too. I don’t think David misses this morning ritual! 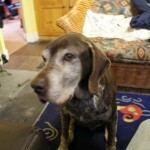 He has been a great family member for nearly 14 years and we all miss him lots. 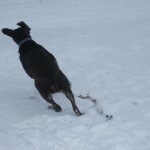 Pebbles has also had a difficult time recently after being attacked on the moor last Autumn. He has just got over a cough and cold but seems to be getting better now and enjoying his walks again. He has been missing Mars too. We’ve had a good Summer cottage wise and the enquiries are still coming in for Autumn and Winter with a trail of new people and regulars wanting to come back. The Lodge makeover has been a great hit with many favourable comments from guests and the wifi systems that we installed in Spring of this year has been well received too. Its amazing how many have embraced technology and arrive with lap tops, tablets, i pods and phones to accompany their holiday and it’s not just the young either – good on yeh folks! The sunny summer weather is forecast to return this week so we’re looking forward to a few trips to the beach and catching those waves. Nothing better when the sun shines. Enjoy the rest of the summer and we wish you a great Bank holiday too.